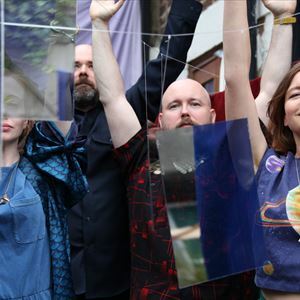 HEN OGLEDD is a project founded by Richard Dawson and harpist, Rhodri Davies, with the addition of Dawn Bothwell and Sally Pilkington. The name of the group is a reference from the Welsh for The Old North. Each hailing from historically different tribal regions of the Old North, the musicians in Hen Ogledd challenge the idea that the ancient world was rife with magic, while the new is infiltrated by cold logic. This has led to the band’s new album for Weird World, ‘Mogic’, being created. This third record from the group is a phantasmal blend of images and ideas that draw upon the mystical and technological. ‘Mogic’ is a discombobulating pop prayer exploring artificial intelligence, witches, nanotechnology, pre-medieval history, robots, romance, computer games and waterfalls. This dynamic album of eddies and swirls, ravishing melodies, hallucinatory textures and rapid rhythms is pinned down by some deft performances: Pilkinton’s picture-perfect pop and earthy singing, Davies’ blazing harp splutterations and guitar moans, Bothwell's twisted telephone techno and bamboozling lyric-bombs and Dawson's utter bass. No small mention must go to special guest Will Guthrie, one of the finest and classiest drummers there is, who's all over this record like long grass on dunes. ‘Mogic’ was released last November and supported by a short tour of the UK, this new date follows on from their sold out Courtyard Theatre extravangaza.